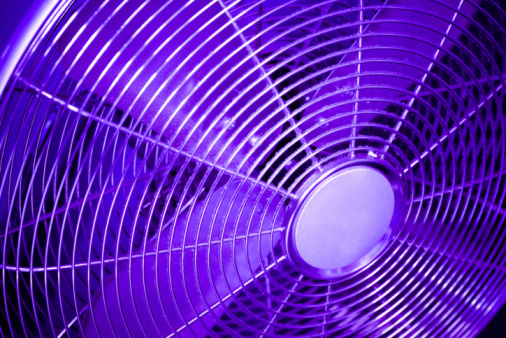 Whether your room feels stuffy or just too warm, ventilating it keeps the air cool and fresh. You don't need expensive mechanics, duct work or home contractors to ventilate your room -- in fact, you may not need to buy anything at all. Ventilating your room is simply a matter of controlling how the air flows through it and where it goes. If you don't give the air a place to go, it stays in the room and gets stale -- give it both a way in and a way out to keep the room well-ventilated. Cross-ventilate by providing two openings in the room. The first should be a window to the outside -- open it as wide as you can to give air a way out. The other can be either another window to the outside -- preferably to a shaded area -- or a door that leads to another part of the house. This opening lets in air that flows through the room to the other opening, and it should be smaller than the window opening. Experiment with different cross-ventilating air paths. The way that air travels throughout your house is relatively unpredictable, so you have to experiment. While the first opening you created -- the wide-open window -- stays the same, experiment with different openings that pull air into the home. The further away these two openings are from each other, the more air circulates throughout the home. For example, open a window in the room across the hall and leave the doors between the rooms open -- cool air enters the home and is pulled toward the larger open window where it escapes, creating a fresh and cooling path between the openings. Outfit your windows with box fans that have adjustable settings. Some box fans are equipped to either push air away or pull it toward and through the blades, enabling you to facilitate more efficient air circulation. Place a box fan in your "intake" window and set it to pull air in from outside, then place another in the "out" window and set it to push air out. This helps you direct air traffic from one ventilation point to the other, prevent air from getting trapped and stagnant between them.